As many of you know I have been working on my craft room for several weeks now. It started when I had new practical vinyl flooring installed...the carpet had to go! At first I told myself I didn't really care how this room looked as long as it was more efficient to work in. Well, that was before I started looking at craft rooms on Pintrest! lol...I decided of course I needed it to be practical and efficient, but it had to be cute too! There was no way I could work in a boring room. You might remember we moved the piano in the living room several weeks ago. This is the wall it used to be on. I added a table (which I am going to make a skirt for soon) and shelves to hold containers and roosters etc. Then I found the curtains half price at Hobby Lobby. I have been seeing alot of craft rooms with "CREATE" on the wall and had to copy that idea. I found the letters and painted them red and hung them yesterday. I am going to use this table to put items on after they are made. All of these items are customs and are ready to be shipped. My container collection is growing! I am starting to get some of the items I ordered at market. I love those gold yellow bird containers you see on the bottom row. I will be doing something in those soon. This is my newspaper spread that my dad had framed for me that I hung by the new shelves. Our local newspaper came and did a story on me this fall about crafting and blogging. Here is a better picture of the curtains. I mentioned I found them at Hobby Lobby last week half price. I spent a total of $30 with the rod. I did have a 40% coupon that I used on the rod. I'll finish this room up soon and will show you the whole room complete. I still have one dilemma though...I don't know where in the world I'm going to put all of the pretty silk flowers I ordered. Still trying to figure that out! 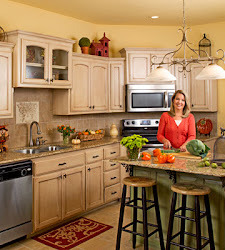 I am trying to make the best use of space out of this room, but I sure wish I could add some square footage! 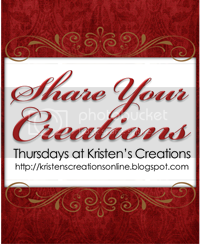 Have a wonderful Wednesday and don't forget to come back and join my Share Your Creations Party on Thursday. I'll have the linky tool up tonight. I hope you are having a wonderful Saturday! Unfortunately I have a head cold, but am trying to make the best of it...I can't hear a thing! lol...Maybe I'll feel better tomorrow. As most of you know I went to Dallas and returned on Tuesday evening. The main reason I went was order supplies to make arrangements, frames and tassels with for my Etsy store. I ended up ordering lots of pretty stuff and am excited to get everything in! I'm hoping it will start coming in next week. There is always so much to look at at market it's overwhelming! I took pictures of some of the displays and items I found interesting focusing on Easter and spring...with a little Christmas at the end. Love the foil bunnies and jars with eggs. Cute moss bunny surrounded by daisies, tulips and lemons. Love the green, white and yellow together...and the birdcages. Color color color! Look at those pretty butterflies in the pots! Pretty wreath with butterflies. Butterflies must be the thing this spring...they were everywhere! I loved this and am going to recreate it. I noticed cloches are everywhere too...this one is so cute with the bunny inside. I thought this basket with the bunnies was so cute. I've got these bunnies on order...they will be the centerpiece of some of my spring arrangements. This shadow box is so cute with a bird nest and eggs in the background. Love it! And look at this...a bird feeder made from two plates and a bowl...how clever! My main reason for going to market was to order some pretty silk flowers for my Etsy store... and boy do I have them coming!! It's always hard to make a decision on what ribbon to order...I love all of it!! Look at these little miniature gardens...aren't they neat? All of the plants are real. Looks like bright green is in. And blue...love the birdcages on the wall. I noticed tons of birds, birdhouses and cages everywhere. I took this picture for the colors in that rug. Love! Cute chair! LOVING the blue! I took this picture for the design and burlap pillows. Burlap is definitely the thing right now! 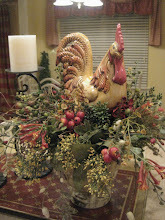 I have these pretty rooster containers on order...love them! I thought these would be easy to make. The french writing is really in right now too. I don't know what these cage ladies are called (that's what I call them) Please let me know if you know. I have been seeing them all over blogland. Thank you Nana Diana...they are called Santos Dolls. I was not in the mood for christmas but still had to snap a few pics of some pretty trees. LOVE the top of this one! Cute!! This tree is so fun and colorful! Now this is different...something to do with those extra limbs laying around. Cute cloche! Love the snowmen inside. You will find everything at market depending where you go. I went up on the jewelry floor and found these unbelievable cell phone cases...WoW! I swear he said the ones on the right sold for over $400! No, I did not buy one of those...lol. One thing I look forward to when I go to Dallas is eating! Sherry and I went to several wonderful restaurants but the one that stood out was called Rise #1. The former President George Bush eats there all the time. They specialize in souffles and these were out of this world! Yum! Sherry and I already dug into them when I remembered to take a picture. I hope you enjoyed my pictures! Have a wonderful rest of the weekend. I think I'm going to take some NyQuil and go lay down. I can't be sick...I have to much to do! Welcome to Share Your Creations Party #22! I hope you all are having a wonderful week! I mentioned in last week's post that I was going to Dallas. Well, I just got back late last night am re cooperating today! 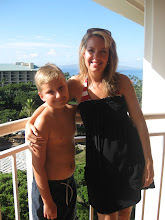 I stayed with my friend Sherry and we had alot of fun. We ate, went to market, and even babysat her grand kids. It was quite a trip! I will share some pictures of market soon. I did end up ordering lots of pretty flowers, rabbits, ribbon, containers, etc. to create new items for my Etsy store. I'm hoping everything will be here in a few weeks...so get ready!! Ann at On Sutton Place shared her beautiful bright dining room with her new framed botanical prints. Beautiful! Farica at Southern Charm made some beautiful feathery arrangements for her living room. What a cozy room! 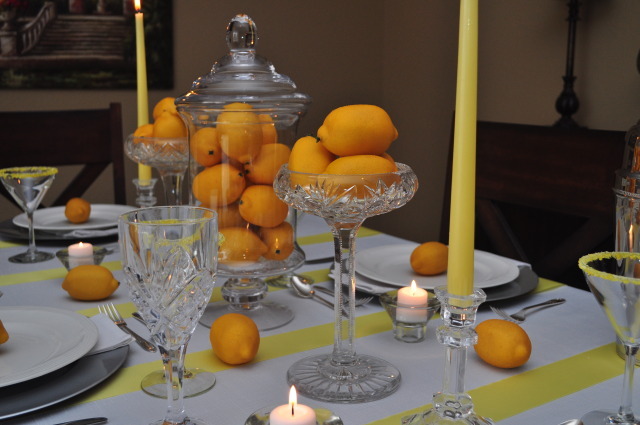 Kathe at Kathe With An E created this pretty "When life gives you lemons" tablescape after having a bad week. This outta cheer you up! Cute! Pat at Ties To The Past created this cute sign. It is for sale in her Ebay store. Love it! 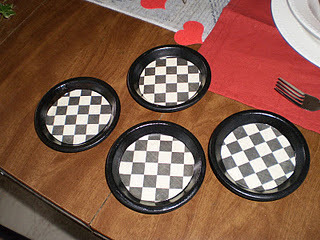 These coasters are cute and easy to make. Visit Donna at One Simple Country Girl for the tutorial. And after...not a huge WOW factor, but I do love the ball fringe! It added a cute touch to the lamps. I also painted the base and finial black and brushed them with silver rub n buff. Here is a better pic of the lamp shade with the light off. This was a very simple project and just added a little bit of a special touch to the lamps. 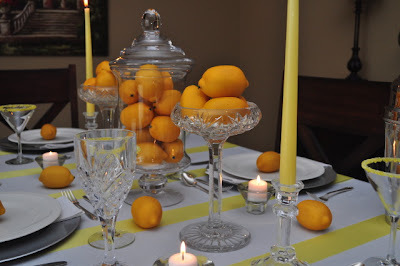 You can link any item you created, any piece of furniture you have painted, any room you have decorated, a vignette, a recipe and the list goes on and on...All I ask is that you add a link back to my blog so others can find the party.